Team pays Enron creditors $2.1 million to get back naming rights to 2-year-old stadium. NEW YORK (CNN/Money) - The Houston Astros will be paying Enron Corp.'s creditors $2.1 million to buy back the naming rights for the former Enron Field, the team announced Wednesday. The stadium will be called Astros Field temporarily, and the team will start seeking to negotiate a new naming deal with another company. The facility had been called Enron Field since it opened in 2000. Enron, the now bankrupt energy company, had agreed to pay $100 million over 30 years to have its name on the facility during that time. Despite the company's December bankruptcy filing, Enron was current in payments to the team through Aug. 30, 2002. But the team filed a motion with the bankruptcy court earlier this month seeking to get the naming rights back, saying it was being hurt by the association with the Houston-based company and that it was concerned that Enron would seek to resell the naming rights for the stadium without the team's approval. "The Houston Astros have been materially and adversely affected by the negative public perception and media scrutiny resulting from Enron's alleged bad business practices and bankruptcy," said a statement from Pam Gardner, the Astros' president of business operations, at that time. 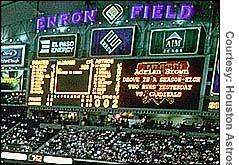 The Astros have paid $2.1 million to Enron creditors to buy back the naming rights of the team's home. Enron attorneys asked the bankruptcy court Tuesday for more time to decide whether to honor the naming rights deal. Enron itself said last week it was seeking to change its name. In Houston Wednesday, team executives said at least seven companies already have contacted the team about naming rights for the stadium. But Astros owner Drayton McLane Jr. called the talks preliminary and could not estimate when a new naming deal might be reached, a team spokesman said. "It's time to move forward," he said in a statement issued earlier. "I am very happy that we have been able to reach this settlement and put this issue behind us." The company also said it was pleased with the agreement. "We are pleased to have resolved this issue with the Astros with a deal that is beneficial to all parties, including Enron's creditors and the city of Houston," Enron President Jeff McMahon said. The team may be stuck with the name Astros Field and without the corporate dollars that come from selling naming rights for some time. A softening in the advertising market has slowed the pace of stadium sponsorship deals. Louisiana tried to sell the name of the New Orleans Superdome starting last summer, hoping to seal a deal before the 2002 Super Bowl that was played there earlier this year. But that game came and went without a new name for the facility. When Enron's financial problems surfaced last fall, team executives said they hoped to be able to keep the Enron name on their home. "We love our name," the Astros' Gardner told CNN/Money in late November shortly before the Enron bankruptcy filing. "I don't know what the market is for that [a new stadium naming deal]. We haven't been out there soliciting for that. At this point, we're hoping we don't have to." Enron had made three payments under the 30-year deal. Team officials declined to elaborate on the size of the payments but Associated Press reported that they totaled about $10.3 million. The company also paid the team $108,000 for a luxury suite and nearly $90,000 for box seats since the bankruptcy filing.